CHINANDEGA, Nicaragua – The second convention of Iglesia Luterana Sinodo de Nicaragua began January 23 with 43 delegates registered representing the 23 congregations that joined together two years ago to form this Synod. Representing Lutheran Church–Canada were President Robert Bugbee, Rev. Dr. Leonardo Neitzel, mission executive and volunteer missionary, Rev. Dr. Ralph Mayan. Dr. Leonardo Neitzel, assistant to the president for Missions and Social Ministry Services of Lutheran Church–Canada led the convention in a Bible study based upon the theme. Centred on John 15:17, Dr. Neitzel’s study outlined three biblical truths. (1) No branch produces fruit by itself. It must abide in the vine—in the Word, in Christ. (2) God, through His means of grace, grafts us into the vine and He keeps us in the Christian faith. (3) Grafted into the vine, He preserves us in that relationship nurturing and making us productive. LCC president, Rev. Robert Bugbee speaks to the ILSN convention. The convention welcomed Rev. Robert Bugbee, president of Lutheran Church–Canada and invited him to bring greetings. He spoke of the joys he had in being present for the convention his greatest joy being that God had brought delegates and guests to faith in Jesus Christ sharing a common commitment to the Scriptures and the Lutheran Confessions. The convention received four new pastors and eight deaconesses into Synod membership. Three of the pastors and eight deaconesses graduated from the Theological Education Program in March 2009. The church received the fourth pastor through a special colloquy program and he serves as a missionary in Costa Rica. The synod welcomed four new pastors and eight deaconesses. Following the adoption of a special resolution permitting congregations not served by a resident pastor to have their second voting right exercised by a deaconess, the president of the ILSN, Rev. Luis Turcios presented his report. 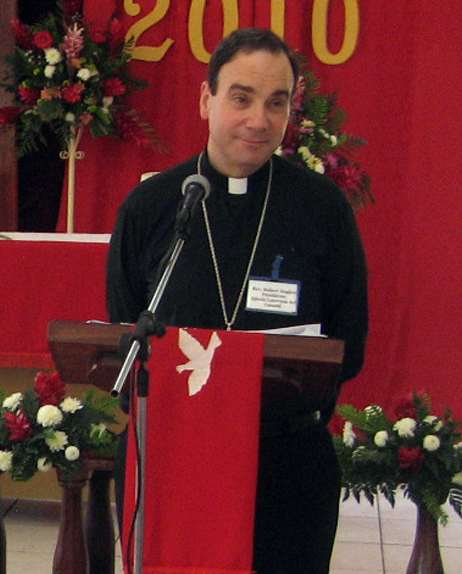 He provided a brief history of the Synod since its inception two years ago. He reminded delegates that just like an infant, ILSN was fearful of making those first steps, but God has been gracious to the new church. God has enabled it to move forward, meeting each challenge with faith in Him and with the love and support of its partners. ILSN president, Rev. Luis Turcia presents his report. He spoke particularly of the challenge the church faces in preparing pastors to serve in the growing church (almost half of the congregations do not have a resident pastor) and referred to a new program being introduced into the church of preparing “lectors” who will can assist pastors in leading “reading” services when a pastor cannot be present for worship. During the Saturday afternoon session delegates conducted the election of the synod’s vice-president. The two candidates receiving the highest number of congregational nominations were Pastor Marvin Donaire and Pastor Angel Salazar. 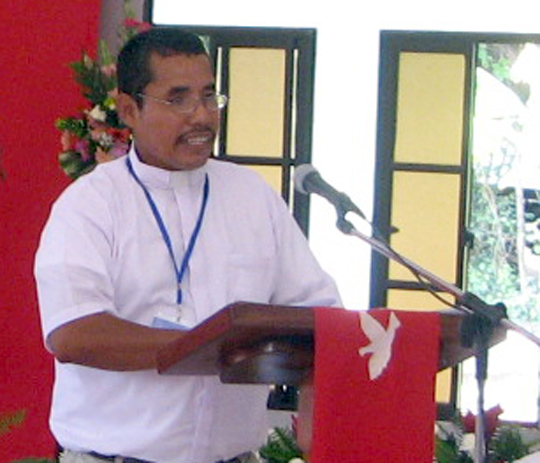 Following the election the President Luis declared Pastor Angel Salazar elected vice-president. The convention then heard reports from the Synod’s six missionaries. Missionary Douglas Agular spoke of his work in Olanchita, Honduras; Missionary Pedro Quintero and Missionary Edmundo Retana outlined their work in Costa Rica. They reported how much they appreciated the work of volunteer teams that visited their mission areas. Those visits expand their contact list and provide them with additional opportunities to share the love of Jesus. Lutheran Church–Canada missionaries Pastors Rufino Quintero, Maximo Urroz and Hector Morales each spoke of the challenges they had faced during their years of service. God helped and strengthened them and blessed their sharing of the Gospel. By God’s grace each missionary had completed service in their first calling and since last March have accepted calls to new areas of mission service. The convention expressed its thanks for the service of LCC’s missionaries and prayed that God would bless their work as they continued to reach out with the Gospel. Other reports included Christian education and finance. Delegates adopted a motion expressing thanks to Concordia Lutheran Mission Society, Canadian Lutheran World Relief, Christian Children’s Concern Society (USA) and Christ Memorial Lutheran Church in Houston, Texas for their support of the Christian education programs. The convention declined to move forward with the expansion of the mission into the Bluefields region of Nicaragua until after the completion of a fourth theological education program so that additional pastoral resources are available to the church. The session concluded with the election of Deaconess Jeryll Adriana Mejia Davidla to the Synod Board as treasurer. The convention closed with Divine Service, Sunday, January 24 in the Martin Luther Chapel with guest preacher President Robert Bugbee. The ILSN Board of Directors designated the offering from the closing service to Haiti earthquake relief.